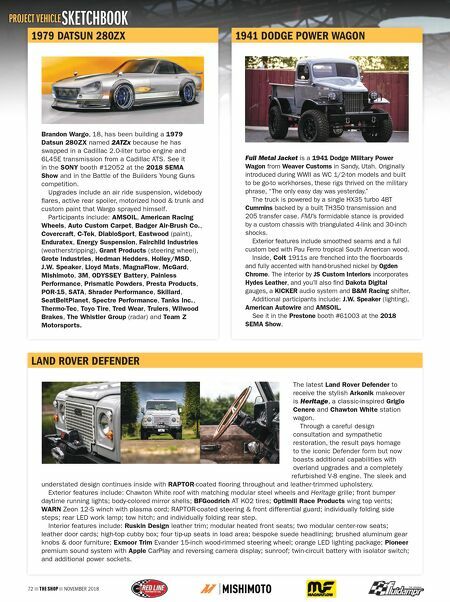 72 THE SHOP NOVEMBER 2018 SKETCHBOOK PROJECT VEHICLE LAND ROVER DEFENDER The latest Land Rover Defender to receive the stylish Arkonik makeover is Heritage, a classic-inspired Grigio Cenere and Chawton White station wagon. Through a careful design consultation and sympathetic restoration, the result pays homage to the iconic Defender form but now boasts additional capabilities with overland upgrades and a completely refurbished V-8 engine. The sleek and understated design continues inside with RAPTOR-coated flooring throughout and leather-trimmed upholstery. Exterior features include: Chawton White roof with matching modular steel wheels and Heritage grille; front bumper daytime running lights; body-colored mirror shells; BFGoodrich AT KO2 tires; Optimill Race Products wing top vents; WARN Zeon 12-S winch with plasma cord; RAPTOR-coated steering & front differential guard; individually folding side steps; rear LED work lamp; tow hitch; and individually folding rear step. Interior features include: Ruskin Design leather trim; modular heated front seats; two modular center-row seats; leather door cards; high-top cubby box; four tip-up seats in load area; bespoke suede headlining; brushed aluminum gear knobs & door furniture; Exmoor Trim Evander 15-inch wood-rimmed steering wheel; orange LED lighting package; Pioneer premium sound system with Apple CarPlay and reversing camera display; sunroof; twin-circuit battery with isolator switch; and additional power sockets. 1979 DATSUN 280ZX Brandon Wargo, 18, has been building a 1979 Datsun 280ZX named 2ATZx because he has swapped in a Cadillac 2.0-liter turbo engine and 6L45E transmission from a Cadillac ATS. See it in the SONY booth #12052 at the 2018 SEMA Show and in the Battle of the Builders Young Guns competition. Upgrades include an air ride suspension, widebody flares, active rear spoiler, motorized hood & trunk and custom paint that Wargo sprayed himself. Participants include: AMSOIL, American Racing Wheels, Auto Custom Carpet, Badger Air-Brush Co., Covercraft, C-Tek, DiabloSport, Eastwood (paint), Enduratex, Energy Suspension, Fairchild Industries (weatherstripping), Grant Products (steering wheel), Grote Industries, Hedman Hedders, Holley/MSD, J.W. Speaker, Lloyd Mats, MagnaFlow, McGard, Mishimoto, 3M, ODYSSEY Battery, Painless Performance, Prismatic Powders, Presta Products, POR-15, SATA, Shrader Performance, Skillard, SeatBeltPlanet, Spectre Performance, Tanks Inc., Thermo-Tec, Toyo Tire, Tred Wear, Trulers, Wilwood Brakes, The Whistler Group (radar) and Team Z Motorsports. 1941 DODGE POWER WAGON Full Metal Jacket is a 1941 Dodge Military Power Wagon from Weaver Customs in Sandy, Utah. Originally introduced during WWII as WC 1/2-ton models and built to be go-to workhorses, these rigs thrived on the military phrase, "The only easy day was yesterday." The truck is powered by a single HX35 turbo 4BT Cummins backed by a built TH350 transmission and 205 transfer case. FMJ's formidable stance is provided by a custom chassis with triangulated 4-link and 30-inch shocks. Exterior features include smoothed seams and a full custom bed with Pau Ferro tropical South American wood. Inside, Colt 1911s are frenched into the floorboards and fully accented with hand-brushed nickel by Ogden Chrome. The interior by JS Custom Interiors incorporates Hydes Leather, and you'll also find Dakota Digital gauges, a KICKER audio system and B&M Racing shifter. Additional participants include: J.W. Speaker (lighting), American Autowire and AMSOIL. 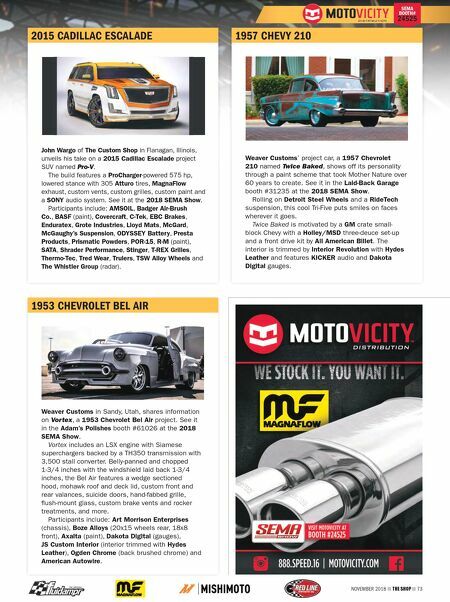 See it in the Prestone booth #61003 at the 2018 SEMA Show.